Unfortunately, most legacies—even positive ones of service and generosity— too often leave future generations wondering who a person really is. In contrast, an intentional legacy is one that allows you to consciously express who you are and what you want to say. Legacy letters not only tell our stories, but also communicate values and wisdom and pass love and blessing from one generation to another. By writing a legacy letter, you preserve who you are and what matters most to you. Your story matters. “I liked the whole focus on trying to find our inner voice, and the systematic steps to achieve that.” —Mike S.
In 2013, Joanne was honored with the Linda and Joel Abromson Award, sponsored by the Jewish Community Alliance. The award made it possible for Your Write Mind® to develop the Legacy Project, a program of systematic steps that allow people to find their inner voice. Click here for 2013 Legacy Project. 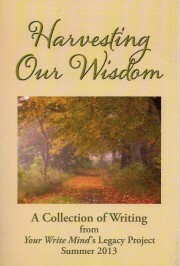 Click here for 2014 Harvesting Our Wisdom writers.